If you are looking for a way to enjoy the beautiful outdoors all year round at your home in Rockville, Maryland, consider a sunroom installed by Allmaster Home Services. Sunrooms enable you to enjoy views of the outdoors without being exposed to the elements and harsh winters that we often see in this area. At Allmaster, we proudly offer sunroom solutions manufactured by BetterLiving Sunrooms, one of the leading brands in the exterior living industry. Our sunrooms boast insulated glass and construction that will ensure you are able to take in all the outdoors has to offer in a comfortable and climate-controlled environment. 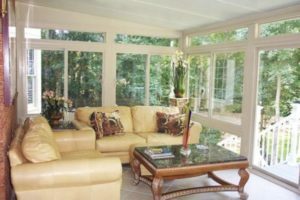 All of our sunrooms boast a number of benefits that set them apart from the competition. These benefits include durable sliding glass windows and doors; built-in and color-matched gutter systems; argon-filled, Low-E, double-paned glass; reinforced vinyl construction; and more. Plus, our sunrooms are installed by dedicated experts who have spent years honing their craft, so you can trust that your new home addition will last for decades to come. What’s more, we are so confident in the products that we offer that we back our sunrooms with a 50-year manufacturer’s warranty for added peace of mind. If you’re interested in having a sunroom installed on your Rockville, MD, home, contact the experts at Allmaster Home Services today.